The Best boxers of all time. 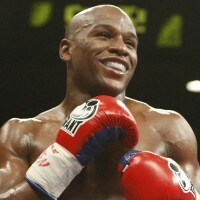 Pound for pound BEST IN THE WORLD!... I'm glad he's number one... I mean its not like he has to prove anything. Spell Manny Pacquiao in English, "THE BEST"
Ali said himself and always maintained that Sugar Ray Robinson is the greatest boxer of all time. He said of himself, he was the best heavyweight. And because he was the larger man, not the better boxer he would have beaten a Sugar. Pound for pound Sugar was the best. Roy Jones wouldn't win against Sugar with both men in their prime even if they fought ten times! What makes an athlete great is not only how much they excel at a sport but how they standardize the sport and how they inspire people (black and white, rich and poor alike). We, unfortunately live in a time where athletes are nothing more than athletes. No one stands up for anything anymore or inspires us to be great at what ever we do like Joe Louis, Muhammad Ali, or Rocky Marciano. Joe Louis has my vote for #1 place. He has an outstanding record and title defenses and well as longevity. Joe Louis #1.
really impressing und stunning - untouchable. combining lightning speed and reflexes with ko-power - he had the complete package. He was so fast, this enabled him to do what he wanted to, although it surely wouldn't work out for anybody else. Should have fought more in his prime and easily beat everybody - he had no opponents. Should have end his career after his heavyeight-title-fight. Dancing queen! Not a patch on Marvellous or the Hitman...but fair play, he could leg it!